Hailed by the Washington Post as “a savvy, sensitive composer with a keen ear, an innate sense of form and a generous dash of pure esprit,” her works have been performed throughout the world, and are enjoyed by audiences at several hundred performances a year and on over sixty CDs. Higdon’s orchestral work, blue cathedral, is one of the most performed contemporary orchestral compositions by a living American with more than 600 performances worldwide since its premiere in 2000. Higdon has been a featured composer at many festivals including Aspen, Tanglewood, Vail, Norfolk, Grand Teton, and Cabrillo. She has served as Composer-in-Residence with several orchestras across the country including the Philadelphia Orchestra, the Pittsburgh Symphony Orchestra, the Fort Worth Symphony, the Green Bay Symphony Orchestra, the Wheeling Symphony and the Arkansas Symphony Orchestra. Higdon was also honored to serve as one of the Creative Directors of the Boundless Series for the Cincinnati Symphony. One of Higdon’s most current project was an opera based on the best-selling novel, Cold Mountain, by Charles Frazier. It was co-commissioned by Santa Fe Opera, Opera Philadelphia and Minnesota Opera in collaboration with North Carolina Opera. All performances in Santa Fe were sold out and Higdon’s opera became the third-highest grossing opera in the company’s history at Opera Philadelphia. 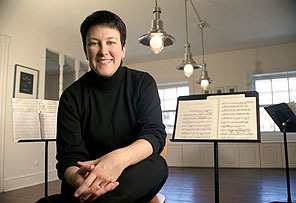 Higdon recently won the International Opera Award for Best World Premiere.